Thanks to Michael Haines , our son-in-law, safari guide and superlative photographer, I have ready to go subject matter for this and other collages in the safari series. Mike not only continues to guide safaris, but is an agent based in Toronto, Canada. Book your next African adventure with Safari and Company. Looks Fantastic !!! So proud of you.....you're doing it !!!! 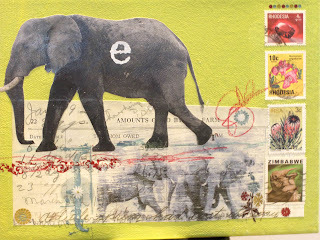 Love the "Farmland" Safari series piece...and now listening to K.D. Lang singing my favourite song...Hallelujah !!! Is that Lily Frost singing ???? ?